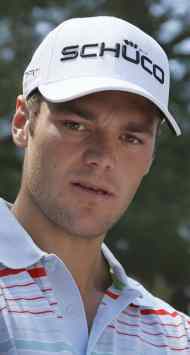 Martin Kaymer became the highest ranked golfer in the World in February 2011. The German won four events in 2010 including his first major, the US PGA Championship. In doing so, he became only the second German to win a major golf championship after Bernhard Langer. He also won the 2011 WGC-HSBC Champions, making him only the tenth player in history to have won both a major championship and a World Golf Championship event. Kaymer won his first professional tournament when just 20 years of age at the Central German Classic on the EPS Tour in 2005. He played in 14 tournaments on the EPD Tour the following year and won five of them, remarkably finishing in the top ten in all bar one of them. In the second round of the Habsberg Classic, Kaymer carded a round of 59. He accepted an invitation to compete on the Challenge Tour and immediately won the Vodafone Challenge. A further success at the Open des Volcans in France led to a fourth place in the Order of Merit from only eight contested events. He earned his European Tour card for the 2007 season. For once, Kaymer did not find it too easy and missed the cut in the Hong Kong Open on his Tour debut. In fact, he would miss the cut in five of his first six events. He found some improvement when tied for 15th at the Madeira Island Open before finishing joint third at the Portuguese Open. His form continued to be sporadic, missing further cuts before finishing in a tie for second place at the Scandinavian Masters. In October 2007, Kaymer showed what he was capable of when shooting an opening round 61 in the Portugal Masters, tying the lowest round of the European Tour season and a new course record. He eventually finished 7th followed by a 6th place finish at the Volvo Masters. He finished the season as the highest-ranked rookie on the Order of Merit, earning him the Sir Henry Cotton Rookie of the Year Award. He had also worked his way into the top 100 in the World Rankings. Kaymer won his maiden European Tour event at the Abu Dhabi Golf Championship in 2008, leading from day one. This catapulted him to 34th in the world rankings and the youngest player in the top 60. He carried his form over to the Dubai Desert Classic, losing by a single stroke to Tiger Woods despite finishing with two birdies and an eagle. Kaymer went on to win the BMW International Open, beating Anders Hansen in a playoff. In 2009, Kaymer finished tied for second as he put up a brave defence in the Abu Dhabi Golf Championship. Kaymer won the Open de France in July by beating Lee Westwood in a playoff, his third European Tour event. The following week he won the Barclays Scottish Open at Loch Lomond and rose to 11th place in the Official World Golf Rankings. He later produced his best finish in a major championship when joint sixth at the 2009 PGA Championship. Kaymer kicked off his 2010 season with victory in the Abu Dhabi Golf Championship and produced some excellent golf in both the British Open (tied for 7th) and US Open (tied 8th). In August 2010, Kaymer won the US PGA Championship at Whistling Straits when defeating Bubba Watson in a three-hole playoff. Shortly after being part of the winning European Ryder Cup team, he won the Alfred Dunhill Links Championship at St Andrews. Kaymer turned down an invitation to become a full PGA Tour member and shared his time between that and the European Tour. He won the Abu Dhabi HSBC Golf Championship title for the third time in four years and reached World Number One status after finishing runner-up in the 2011 WGC-Accenture Match Play Championship. In November, Kaymer won the WGC-HSBC Champions event in Shanghai after a final round 63. In September 2012, Kaymer defeated Steve Stricker by one hole in the Ryder Cup to retain the trophy for Europe. He has elected to join the US PGA Tour for the 2013 season.